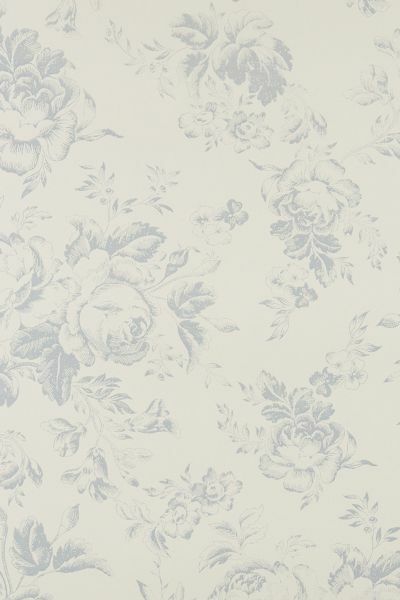 Floral Cabbages & Roses wallpaper in the Paris Rose Blue print. Printed on a non-woven base rather than paper, this gives the wallpaper a high quality look and beautiful texture. Printed using a new technique called flexo printing, it enables the very fine lines of the design to be accurately and expertly printed to a high standard. Please ensure that you check the batch numbers of each roll match before you start using the wallpaper. We make every effort to double check before we send, but owing to the fact that we sell through other retailers it is always worth double checking before you start wallpapering! Our Wallpaper is non woven which means that you can paste the wall rather than using a wallpaper table which is very handy. You do need to use a special paste for this however and a good hardwear shop will be able to tell you the correct paste to use.